Ross-Simons spoils you with fabulous jewelry at great prices. Shop for diamonds, designer pearl jewelry, gemstones and more. Ross-Simons jewelry - For over half of a century, Ross-Simons jewelry catalogs have dazzled you with an unmatched collection of gorgeous jewelry. Experience impeccable quality and exceptional value with a selection that ranges from diamonds, gold and silver sparklers to designer pearl jewelry and designer gemstone jewelry as well as elegant tableware, gifts, crystal figurines and unique collectibles. Designer pearl jewelry - Delight any lucky lady with designer pearl jewelry that will always make a classic statement. From glorious pearl rings to bracelets, pendants, earrings and pins, you'll add an instant touch of glamour and sophistication with cultured pearl jewelry when you click and pick your favorite styles from the Ross-Simons jewelry online catalog. Designer gemstone jewelry - Shop with confidence from Ross-Simons for designer gemstone jewelry that covers a rainbow of radiant colors. From spectacular emeralds and sapphires to rubies, turquoise and topaz, you'll find the perfect gem of a piece online, or in the pages of the Ross-Simons fashion jewelry catalog. Diamond jewelry - Diamonds are every woman's best friend, so treat her to vintage diamond pieces and treasures that show off flawless cuts, color and clarity. Shop Ross-Simons fashion jewelry catalog for diamond tennis bracelets to stud earrings, designer pearl and diamond jewelry, and of course, an engaging collection of diamond engagement rings featuring thousands of certified diamonds. Gold and sterling silver jewelry - Whether you're celebrating a Birthday, Silver or Golden Anniversary, the Ross-Simons jewelry catalog features a fine selection of unique sterling silver jewelry that shines as well as elegant gold jewelry available in both white and yellow gold, with selections ranging from 14kt to 22kt gold styles. 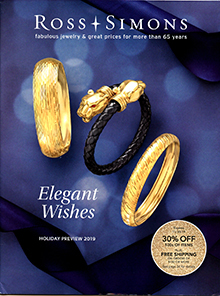 From estate gold and sparkling diamond jewelry pieces to unique sterling silver jewelry, fashion gemstones, designer pearl jewelry, fine giftware and tableware, you will discover the most precious selection of gifts available online, featured in the highly decorated collection of Ross-Simons jewelry catalogs.